« Woody Woodpecker – Friend or Foe? It was beautiful yesterday morning. The sun was beginning to come up through a hazy fog as I looked out of the window. I could just see a hint of orange glow through the trees. It was 21°F and there was still a dusting of snow on the ground from our little snow squall the day before. 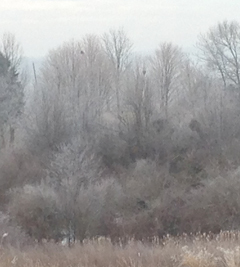 Looking off to the west, the fog seemed a bit denser and the trees looked ghostly white in the distance. The fog was lifting by the time I was driving to work but the crystalline world that it left behind was breathtaking. 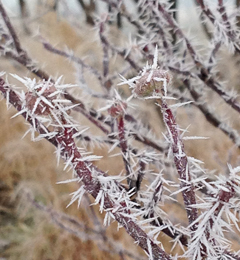 The trees, shrubs, fences, and almost any solid surface were covered with white ice crystals. 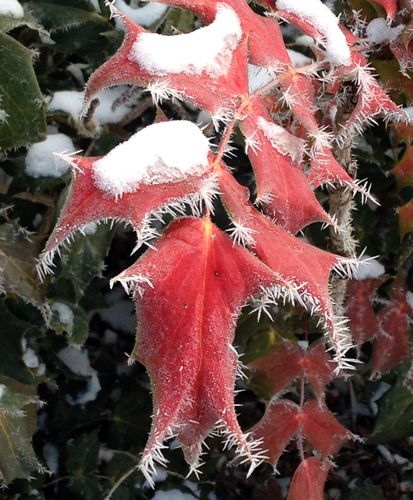 My first thought was that this was hoar frost but hoar frost develops on cold, clear nights. Wednesday night had been cold but overcast. As dawn approached, the humidity rose above 90% and the dew point dropped to within 2 degrees of the air temperature (data from Weather Underground). The combination of these two things led to the formation of a light fog. Because the temperature was so cold, the tiny droplets of water that made up the fog became “supercooled” but remained liquid – until they came in contact with a solid surface at which point they froze almost immediately, forming beautiful ice crystals on whatever they touched. 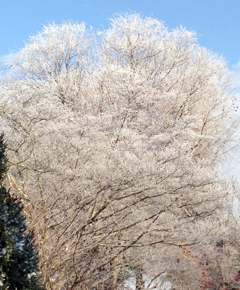 This phenomenon is called freezing fog and the ice crystals that it forms are called rime ice. Hoar frost can look very similar to rime ice but hoar frost forms when the water vapor in the air turns directly to ice crystals without first condensing into water droplets. This can occur on cold, clear nights. 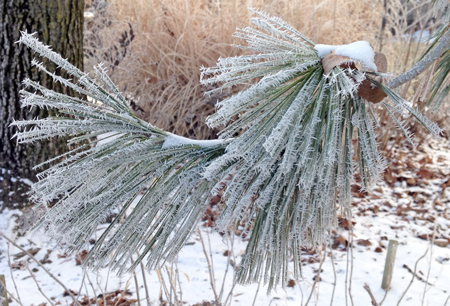 Rime ice forms from fog (freezing fog). The tops of mountains are often covered with rime in the winter. I often see it in Vermont when low clouds envelop the mountains (fog is just a type of low-lying cloud). 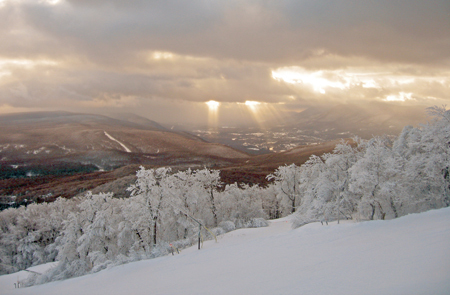 When the clouds lift, the trees on the mountain tops are cloaked in brilliant white ice crystals. It is beautiful! I wandered around the nursery gardens for a while armed with just my iPhone for a camera. When I left the house, I didn’t expect to find myself in the midst of a spectacular winter wonderland! Oh well, I still managed to capture some of the beautiful ice formations before the sun managed to destroy them. 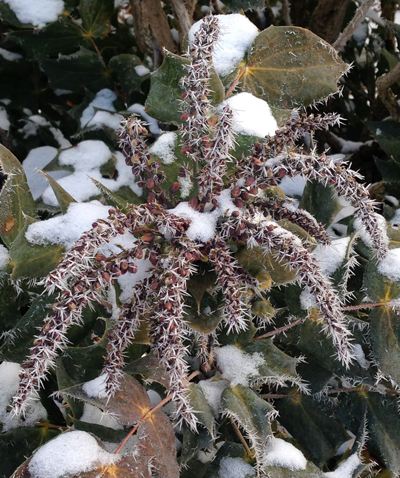 Beautiful mahonia foliage is outlined by crystals of rime ice. Lori, thanks for sharing your beautiful pictures!! Spectacular pictures. 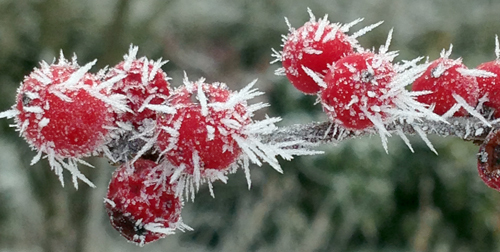 So glad to learn the difference between hoar frost and rime ice, too. Nature is always the most fascinating. Floyd, Va on Wed. after the sleet and rain.